Principally a artist who drew elegant fashion women for postcard manufacturers. Was born in Tunbridge Wells but moved to Bradford early in life. He studied art at the Shipley School of Art and Bradford College of Art. He exhibited paintings several times at Bradford Art gallery (Cartwright Hall). 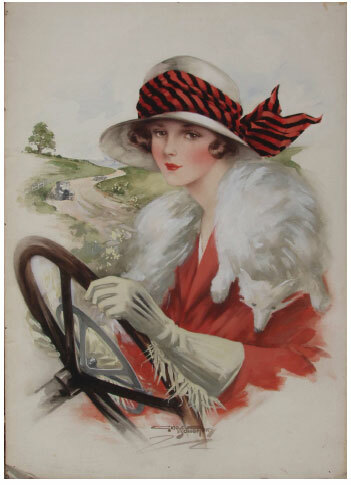 The only motoring painting seen is a view of a glamorous woman with a car in the background. This has the feel of a design for a postcard. When initially examined it looked American in style, as USA magazines often used pretty woman and cars as cover artwork.. Glamour is heightened by the illusion of Continental travel with background cars on the ‘wrong side’ of the road.